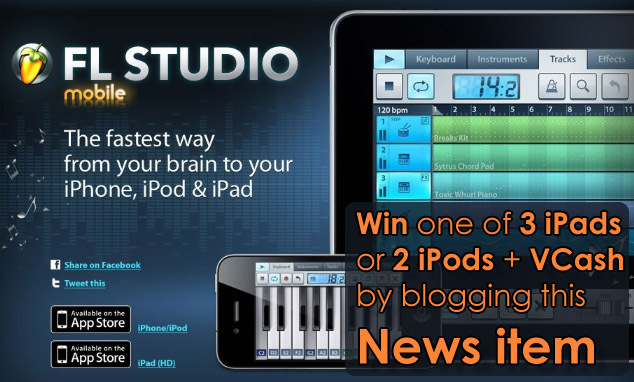 FL Studio Mobile is available in iPhone/Pod and iPad (HD) versions. Just go to the App Store and if you have an iPhone/iPod Touch FL Studio Mobile OR if you have an iPad FL Studio Mobile HD. Does this mean FL Studio on Mac OSX soon? FL Studio Mobile is not a port of the Windows version of FL Studio. It is the product of a completely separate development team, and code, so FL Studio Mobile, while compatible with FL Studio has no impact on FL Studio development and vice versa. Can I load my own samples? Not in version 1.0. We plan to enable user uploads in a future update. Can I use VSTs? No, iOS does not support VSTs and frankly the devices it runs on don't have the CPU power to perform the synthesis you are used to on a desktop. FL Studio Mobile uses high quality sample based instruments made from Image-Line plugins and sample packs.